Pet memorial, pet stone memorial, dog stone, cat stone, rainbow bridge, pet loss, pet sympathy, memorial gifts, loss of pet, pet sympathy gift, pet remembrance 10-11 Inch. CLICK "SELECT OPTIONS" ON RIGHT OF THIS PAGE TO ADD PERSONALIZATION INFO. • A WONDERFUL PET MEMORIAL GIFT- This stone memorial will offer comfort to those who have lost their beloved pet. This memorial is made from natural stone. The stone is engraved with the name of your pet. 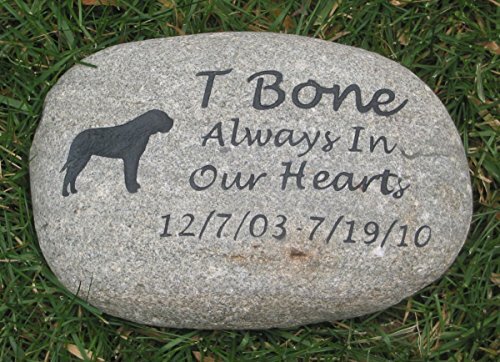 A touchstone to remember your beloved pet. • PET LOSS - Grieving your pet is a natural process. Whenever you lose a loved one, they will be missed and you feel their loss in many different ways. This stone will help with the healing. • PET SYMPATHY - There are many online resources to help with the loss of your pet. • NATURAL STONE FOR INSIDE AND OUTDOORS- This stone have been engraved using a sandblaster and then 3 coats of paint is applied. I do recommend that every 2 years, you apply a light coat of clear acrylic spray paint on top for added protection. • I will customize a pet memorial for your pet within 3-5 business days. If you have any questions about this product by Mainline Engraving, contact us by completing and submitting the form below. If you are looking for a specif part number, please include it with your message. Waterproof designer Dogmeo dog bed. Washable cover. L size. Unique Pet Urn "Natural beauty"
Unique Pet Urn "Plain Perfection"
Unique Pet Urn "Asian forest"